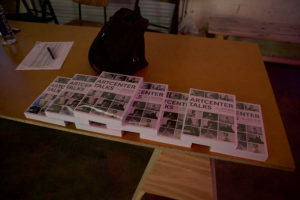 Art Center Talks: Book Launch & Panel Discussion. December 11, 2016. 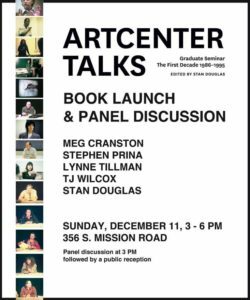 In conjunction with the panel discussion and book launch for Art Center Talks at 356 S. Mission Road on December 11, 2016, Mia Laska interviewed the book’s editor, Stan Douglas. 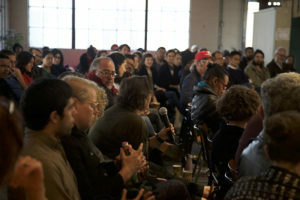 Mia Laska: Maybe we could start with a general question about the ArtCenter Graduate Seminar and ArtCenter Talks. Introduced in 1986, this year the Graduate Program is celebrating its thirtieth anniversary. But how did it all start? 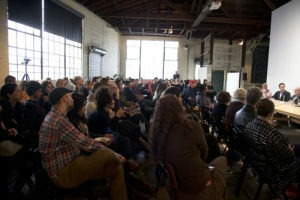 How does it serve the art school to have public talks, for an audience beyond their students? 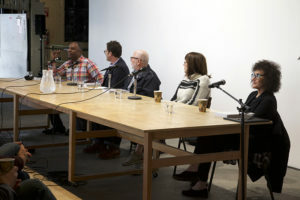 Stan Douglas: I wasn’t there so I can’t exactly say how it began. But part of the “character” of Art Center has always been discourse. One of the things we do is we have a lot of different visitors coming in, we have a lot of adjunct faculty and different scales of conversations that are happening between students, faculty, and visitors. The Graduate Seminar is a part of that. SD: In essence, it’s just people talking to other people and that never really goes out of fashion. 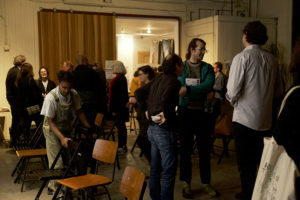 So we get people together to present their ideas in different ways, in ways that change from person to person. An art historian or theorist may have different approaches to presenting their ideas than an artist. Sometimes it’s very visual, sometimes it could be all language. Many different approaches are taken. ML: Have those talks always been open to the public? SD: In the early days it was in smaller class rooms. Later it became more elaborate and we began using a fancy theater in the Elwood building which we also use it as a class room every now and then. It’s bigger and the more people, the more discourse. ML: Could you tell me a little bit about the actual process of compiling the final material? 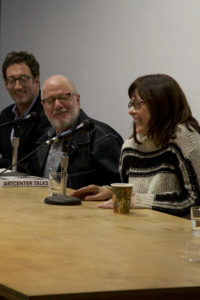 How well have those talks been archived by ArtCenter? Did you have access to video material, photos or even transcripts of all the talks? ML: That’s wearisome. In the end, how long did it take you to make the book? SD: I would say I began in earnest in January (2016) but I was dipping into the recordings as early as last fall. I thought it would just take 3 or 4 months, but it needed frequent attention for most of the year. ML: That actually doesn’t seem too bad. Figuring that there were more that three hundred talks that took place at the ArtCenter. SD: Over the 30 years. I was only concerned with the first ten. I began with the spreadsheet and made a long list of names I didn’t recognize and listened to those recordings. 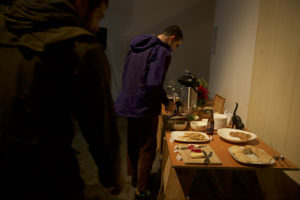 Then I considered those people along with the ones that I did know, developed a vague set of criteria, listened to a selection of the ones I knew, then disqualified all of the boring talks and finally had to decide between artists or theorists whose positions covered overlapping territory. ML: This book documents the first decade of the department’s existence. Why did you focus on the first 10 years? SD: That was just a pragmatic decision. History officially begins when things are 20 or 25 years in the past, so this is the first “historical” chunk of the Art Center talks. ML: Are there any plans to work off the remaining 20 years? SD: If it happens it won’t be me: it was a lot of work. ML: Regarding your own artistic practice, I learned that you create films, photographs, and installations that reexamine particular locations or past events. That your works often take their points of departure in local settings, from which broader issues can be identified. You look at moments where there is a transformation in society. Where things are in flux and choices are made what the future will look like… Did you follow a similar pathway when working on this book? ML: Would you say this book is about the history of ArtCenter or more generally about art during that time? SD: I was not that rigorous. I was not here. I don’t know that much about the culture of ArtCenter of that time. I did talk to people to get an idea of what the general preoccupations were but, as I say, I a lot of significant things were left out. Some important local artists who spoke are not represented because I believe they was already well-represented elsewhere. My main editorial proposition is that the practice of postmodernism is much older than it is commonly assumed to be, that the postwar Neo-Avant-Garde participated in the postmodern condition. I came to this notion after hearing the lecture by the Venezuelan intellectual Luis Castro Levia. It was a sketch of the history of the art of his country from 19th century academic painting through the 20th century, which suddenly goes from Impressionism to what he calls “Constructivism” in the work of artists such as Jesús Rafael Soto or Alejandro Otero. They wanted to make their New World culture “modern” by bringing forms of Modernist art home from Europe, and I argue that this is not dissimilar from what artists promoted by Clement Greenberg were doing in New York. Even though the idea of autonomous “Modernist” painting was the dominant ideology for a couple of decades after the war, it came to this country by way of that quintessentially postmodern gesture of appropriation. 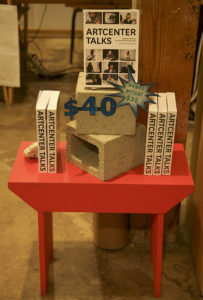 ML: Do you think the book has a different impact for people who have a relationship with ArtCenter? SD: People who were there might have an uncanny sense of resurrection. Meg Cranston, for example, was hosted by Mike Kelley and there’s quite an extensive dialogue between the two of them of during her talk, and she said it was eerie to hear Mike’s voice and her own. 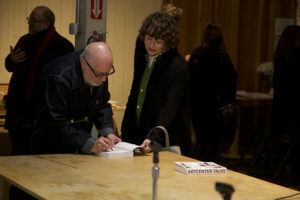 Then there’s symposium that Rob Storr organized in response to Ann Goldstein and Mary Jane Jacob’s exhibition A Forrest of Signs(MoCA, 1989). 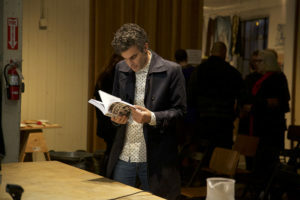 One of the participants recalled that there were more people on stage than there were in the audience so this book gives it a much broader audience than it had initially, as it provides a fascinating document of some prominent concerns of the time: an anxiety about the art market’s influence on art production which seems quaint today, the theoretical touchstones of which people were starting to get pretty weary and, of course, the idea of postmodernism itself which most found to be embarrassing. As a style, postmodern was pretty embarrassing but as a condition it is something that is still with us. at 356 S. Mission Rd.